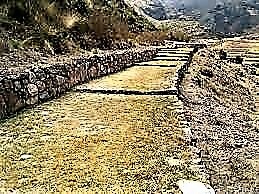 If anyone were concerned with my choice for the greatest surviving wonder of the ancient world, I would have to look no further than what is now called the Great Inca Road. It has the antiquity, the mystery and the sheer magnitude to rank as a wonder of the world, if not the greatest one. 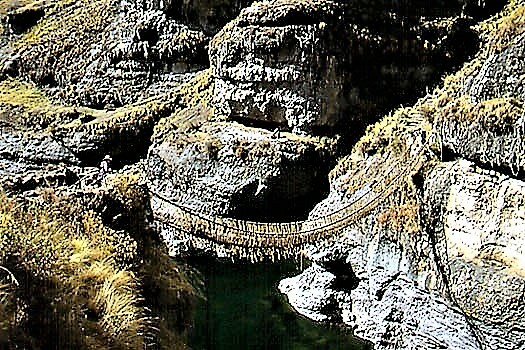 Called in the original languages Qhapaq Ñan (“khă-păk nĭyān”), meaning "the beautiful road," it has the name that the Inca used for the great highway, even though they did not build it. 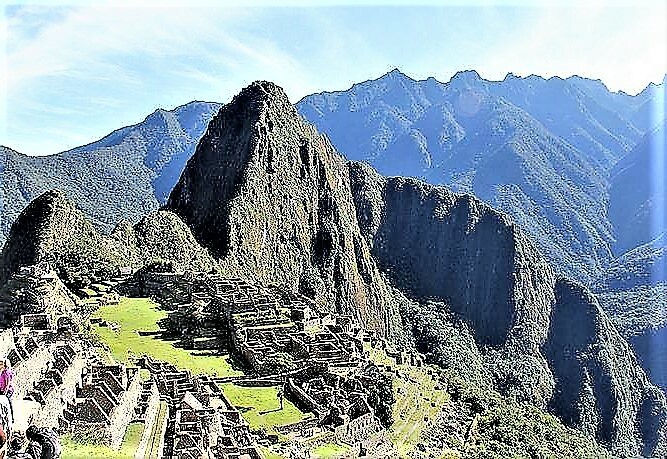 The Inca and later the Spanish appropriated (and even, to a small extent, expanded) the great roadway for their own military and trade purposes, to unify their vast areas of conquest. In the way of all thieves and conquerors they named the road as a way of laying claim to it. The Spanish called the branch that ran along the higher regions “El Camino Real” (the King’s Road). 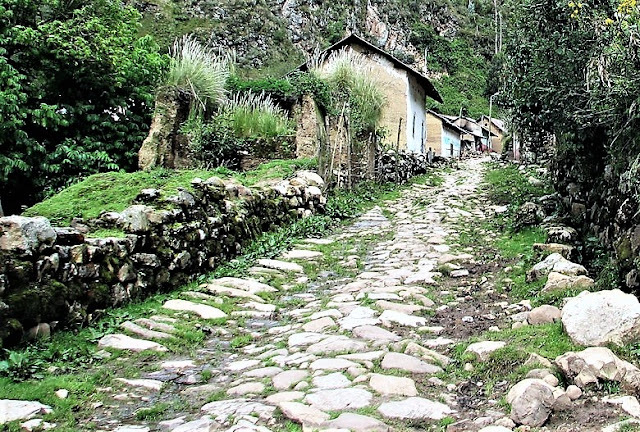 The lower road was called “El Camino de la Costa” (the Coastal Road). We English speaking people call it the Main Andean Road (no points for creativity on any of these). In testimony of both the arrogance and the ignorance of both the Spanish and our own culture, no one really knows how far the entire road system stretches. How can you claim something you can’t even map? The main roads have many branches to various places. The Inca added some branches to places that they wanted to service, their own towns, for instance. However, there are many branches of the road that lead to places that have never been explored. In addition, all of the megalithic sites in the South American continent (such as Tiawanaku, Puma Punku, Machu Picchu, Sacsayhuaman, Ollantaytambo and Quito) have their own branch of the Qhapaq Ñan even though the Inca had no real interest in most of them. Since these megalithic structures are thousands of years older than the Inca, logically the Qhapaq Ñan is also thousands of years older than that civilization. 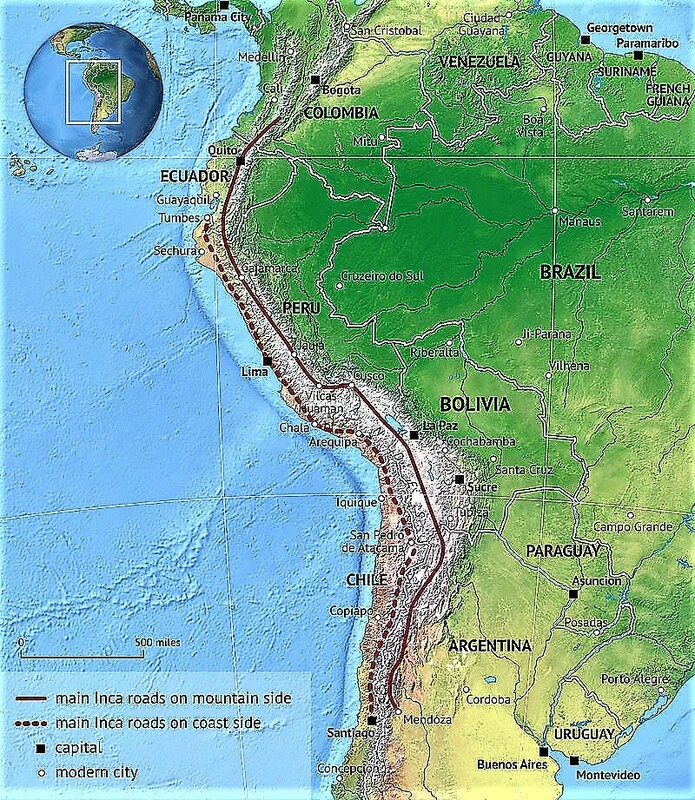 The two main thoroughfares run along the west part of the South American continent from northeast to southwest, along the spine of the great Andes Mountains, with a twin road running at a lower level to the west on the lower coastal plains. The road system provided access to over 1,200,000 square miles of territory. The two main roads run about 25,000 miles long, from Ecuador to Argentina. The Great Wall of China, for all its fame, is only 5,500 miles (and no, you can’t see the Great Wall or the Qhapaq Nan from space). There are so many unknown and unexplored branches of it, however, that no one has any idea of how far the Qhapaq Ñan really extends in total. As impressive as that is, it is not the only, or even the most, impressive feature. 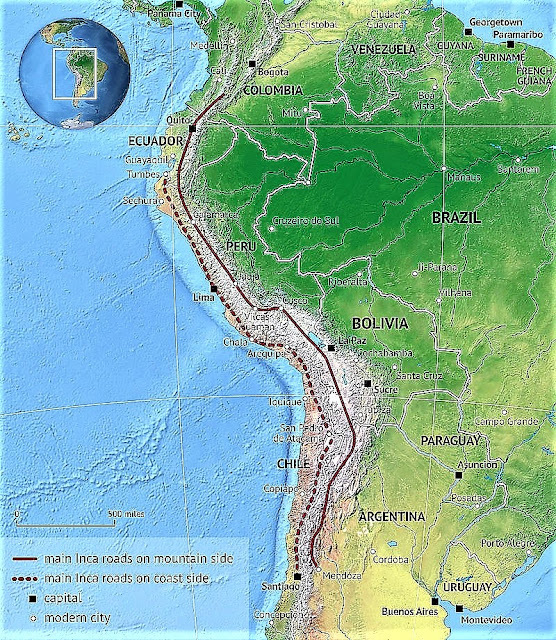 More than twenty of its various routes run over the western mountains, while others traversed the eastern cordillera (a system or group of parallel mountain ranges together with the intervening plateaus and other features, especially in the Andes or the Rockies) in the mountains and lowlands. Some of these roads reach heights of over 16,000 feet above sea level. They were situated generally between 1,600 to 2,600 ft. above sea level. The roads varied greatly in scale, construction, and appearance. 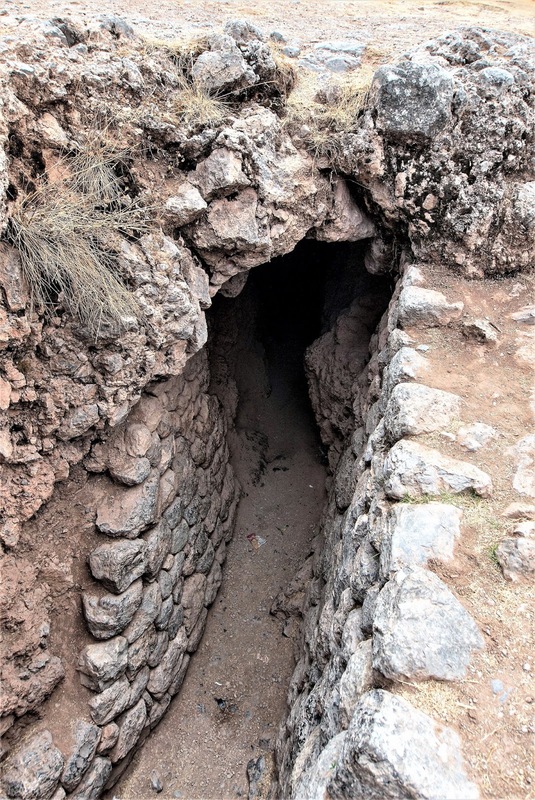 That depended on whether they were built by the megalithic builders or the later jumped up barbarians culminating in the Inca (who, incidentally, had neither writing, the wheel, nor any significant beast of burden and who’s stone working skills were massively inferior to the previous megalithic builders). For the most part, they varied between about 3 to 13 feet in width, although this monumental road could reach 66 feet in width. One of the things that made the roads so incredible is that they traversed the Andes, those amazingly tall, steep mountains. 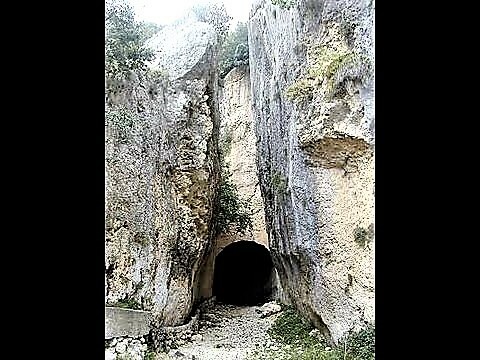 They had to bore tunnels through solid rock walls. 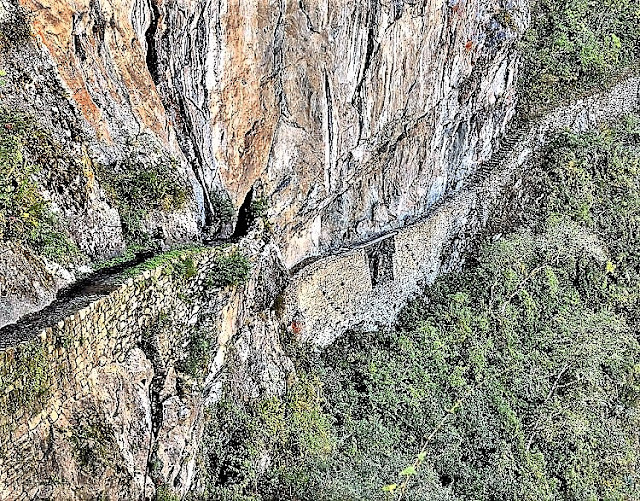 They cut narrow paths along sheer cliff faces. 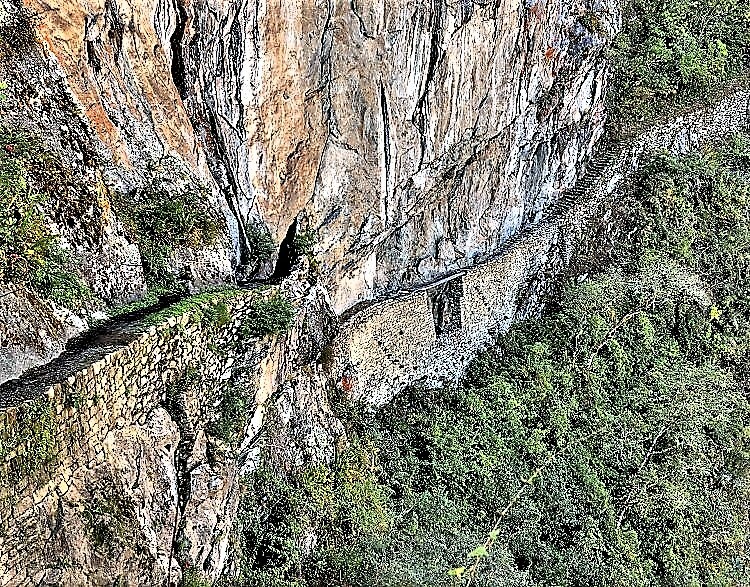 On steep slopes, they built stone steps resembling giant flights of stairs. In desert areas, near the coast, they built low walls to keep the sand from drifting over the road. In conclusion, once again we see a megalithic construction, made by a people before memory and without identity. Almost beyond modern comprehension in its scope and in the skill of its construction, it shares many characteristics with other megalithic constructions, both on its own continent and on others (ex., Sacsayhuaman in Peru, the Egyptian Valley Temples, the ancient temples of Malta and the cyclopean city of Mycenae). More evidence for an ancient people of unfathomable capabilities and participating in a global civilization. The story of the Archetype culture of the pre-flood world continues to unfold. So, there is nothing new under the sun.